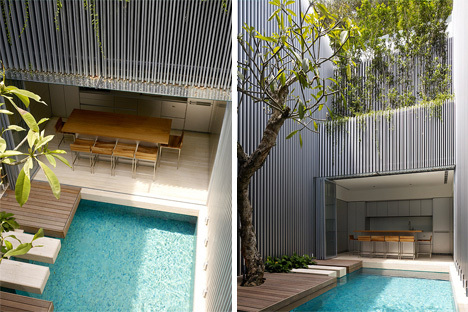 Tough restrictions on how much the building’s facade could be changed were not a problem for the renovators of this home in Singapore. Architects Ong & Ong managed to keep the building’s historic facade intact while creating an entirely new, updated interior. 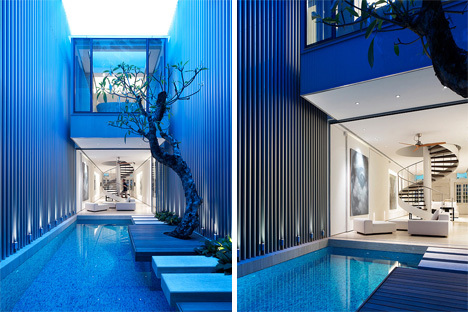 Perhaps the most striking single feature of the residence is the interior courtyard, complete with a swimming pool. Stepping stones lead between the living room and dining area on the first floor. This thoroughly modern space is delightfully bisected with a mature frangipani tree, creating a comfortable contrast between man-made and natural materials. This space not only serves to define the interior spaces of the home; it adds some much-needed light and ventilation throughout the house. Partitions on either side of the pool can be closed to segment the space or opened to create one continuous room. Lining the courtyard is aluminum wall cladding. These lightweight bands add a lovely modern touch to the courtyard, but they also serve the very practical purpose of reflecting light into the interior living spaces. The contrast between the building’s traditional ornate facade and these modern metallic bands sets the tone for this home full of dualities. The entire second floor of the home’s main section is devoted to a massive combined master bedroom, office and en suite bathroom. 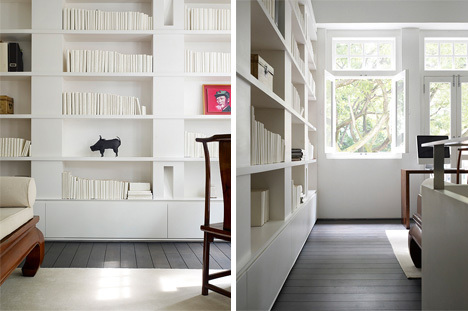 Although full of light, this section of the house is softer and much more subdued than the first floor public areas. Contrasting dark and light materials are used throughout the space, creating a comfortable retreat. Dark walnut plank flooring leads to the en suite bathroom, which is contained in a sort of box which is cantilevered over the pool area. Directly across the courtyard from the bathroom, a rooftop deck adorns the other half of the home – allowing for a daring look right into the glass-walled room. A stunning sculpted stone bathtub is undoubtedly the crowning glory of the second floor. 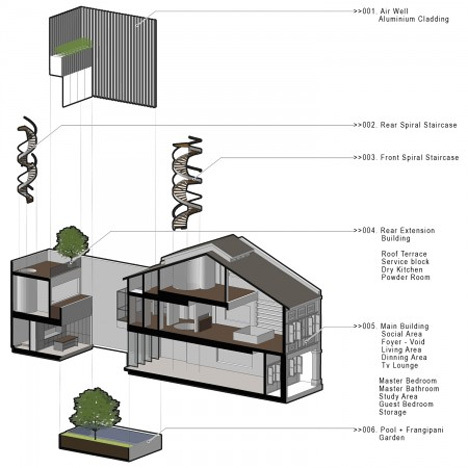 Each element of this home renovation was carefully selected both for functionality and for looks. The natural elements perfectly offset the man-made modern elements. The twisted trunk of the frangipani tree echoes the curves of the dual spiral staircases. Glass and aluminum are balanced with natural wood and grasses. 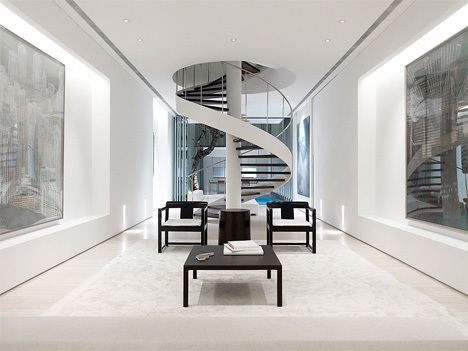 The public living areas in the front of the home contain well-hidden electronics concealed by large pieces of art. Putting these distracting electronic toys behind a movable partition helps to preserve the serene modernity of the home. 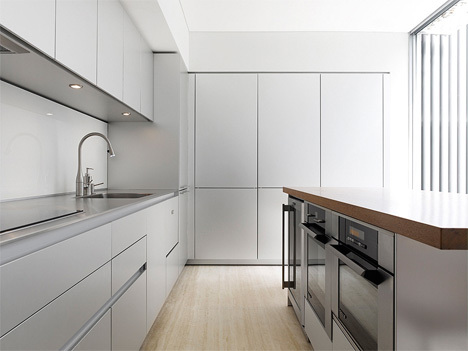 The rear part of the home, which houses the kitchen and other service areas, is similarly smooth, modern, and free from clutter. The home’s overall effect is one of relaxation and a complete escape from the pressures of the outside world.